The parkway is the quintessential American road typology. In a nation so tied to the automobile, it combines recreational motoring with the scenic symbolism of the American landscape. These roads, offering a blend of leisure, infrastructure, and cultural heritage, have shaped the way we move through and view landscapes and regions, and yet the scale of their impact on physical surroundings is often underestimated. The emergence and evolution of the parkway can be traced through the formal institutions of the National Park Service (NPS) and federal, state, and municipal transportation planning. These organizations began considering the visual character of roads, and integrating them with parks and landscapes as a way of appealing to a growing number of motor tourists in the early twentieth century. The parkway’s history can be further traced through the early history of landscape architecture in America. In the late 1800s the pioneers of American landscape architecture, including Olmsted and Vaux, introduced the term “parkway” to refer to roads set in generous landscaped corridors, and simultaneously began to focus attention on the sequence and experience of roads within gardens and landscapes. The first parkways in North America emerged between 1880−1900 as landscaped connectors between urban areas, or between parks and urban areas. These roads were essentially a North American interpretation of the European avenues and boulevards of the nineteenth century, combined with a concept of the picturesque carriageways of English parks and gardens. The parkway typology later evolved to exist independent of its function as a connector, and came to refer to a road set within a park or scenic, often native, landscape. In this iteration, the parkway was no longer simply a connecting element, but instead it became the destination itself, allowing the roads to take on a new role and definition in the regional context. In both cases, the term “parkway” offered a democratic interpretation of the elitist ideals of the avenue and boulevard, and evoked pastoral associations, indicative of the period’s popular fascination with the American countryside. While roads like the Bronx River Parkway have become part of many Americans day-to-day experience, the scenic rural parkways are what grew into icons of national values, beloved by the country, and interpreted by locals and tourists alike as the definitive American experience. The concept for an Appalachian parkway emerged at a strategic moment, when the concurrent state of growing regional conservation efforts, a declining economy, and booming auto-ownership set the stage for political and public support. At the beginning of the twentieth century, wilderness and nature were widely considered to have beneficial restorative effects, promoted to counter the influence of urban dwelling. The National Park Service was a strong proponent of these benefits and advocated both the inherent edifying quality of exposure to nature, as well as the programmatic opportunity of education through projects like the parkway. 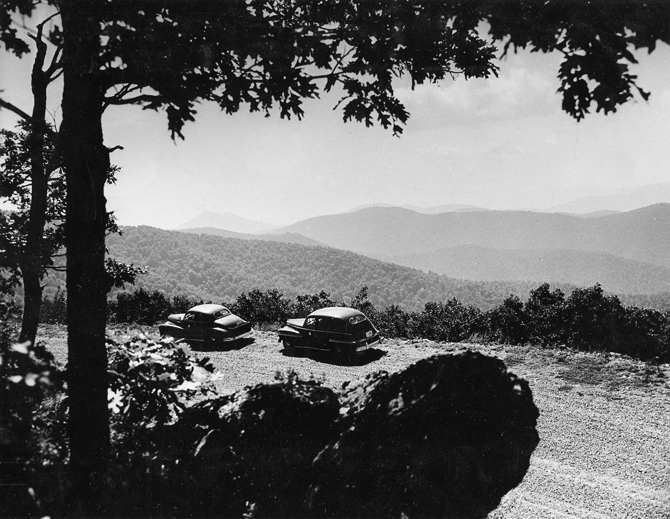 The visual experience of the Blue Ridge Parkway was intended to emphasize the cultural landscape, and evoke the pioneering spirit through pastoral vernacular scenes. These values of the NPS were complimentary to the motivations of the conservation movement and nationalistic heritage tourism, both of which helped spur the development of the regional parkway, glorifying the American landscape and the idyllic agrarian history. Blue Ridge Parkway map © Courtesy of Western Regional Archives, State Archives of North Carolina, Department of Cultural Resources. The strength of the parkway is in its scale, its apparent ease and harmonious coexistence with the landscape, and its effortless presentation of American wilderness and vernacular beauty. Beneath the surface, however, the parkway is a thoroughly controlled landscape experience, thus the narrative of the road is rigorously curated, and its legacy intentionally planned, constructed, and maintained. This harmonious and idyllic pastoral aesthetic is in fact the product of a combination of pro-business support for recreational motoring and an aggressively nationalistic heritage tourism. Excavation cut, 1936 © Courtesy of Western Regional Archives, State Archives of North Carolina, Department of Cultural Resources. 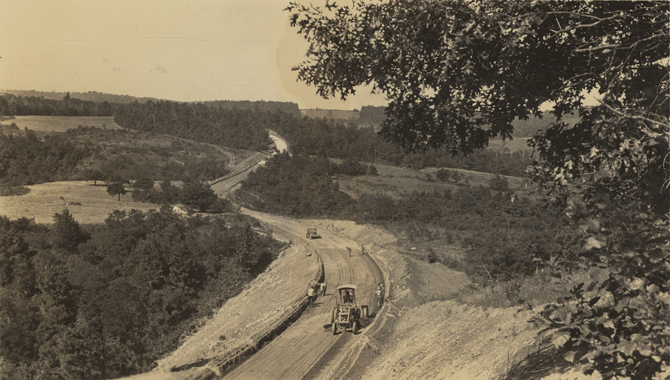 Parkway under construction, 1936 © Courtesy of Western Regional Archives, State Archives of North Carolina, Department of Cultural Resources. 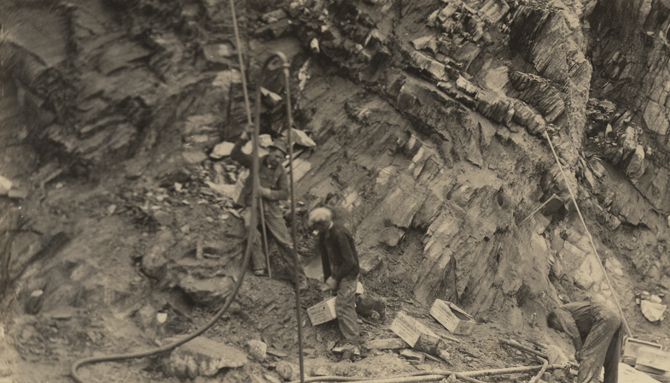 Loading Holes for Blasting, 1937 © Courtesy of Western Regional Archives, State Archives of North Carolina, Department of Cultural Resources. In addition to agricultural controls, controls on architecture and construction were also strictly enforced. Barns and homesteads that were deemed to be particularly aesthetic were dismantled, reconstructed, and restored in new locations so as to create the most effective view from the roadway. Guidelines on how to maintain every detail, from roof finish to fence posts, were dictated by the parkway designers and planners. While the parkway is often perceived as an untouched, idyllic pastoral scene from the past, in reality it is a heavily restored, maintained, and even fabricated landscape of romanticized mountain life. 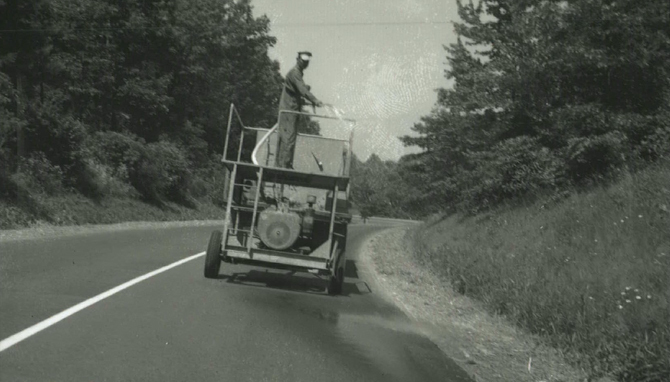 Hydroseeder on parkway, 1959 © Courtesy of Western Regional Archives, State Archives of North Carolina, Department of Cultural Resources. A drive along the parkway presents intentionally framed views, staged scenes, and a thoroughly constructed narrative of regional heritage, presented as though it were authentic. The parkway became the most effective form of propaganda for the burgeoning tourism economy and conservation movement at the time of its planning and early construction. Roadside scenes and attractions constructed a narrative of the road that promoted the romanticization of pioneering mountain culture, and the glorification of scenic landscapes and apparent untouched wilderness. Given the timeliness of the roadway’s planning and construction, these themes were eagerly received by the regional and national population, who flocked to the road for vacation and patriotic celebration of American culture and values. Since 1946, the road has been the most visited site in the NPS. 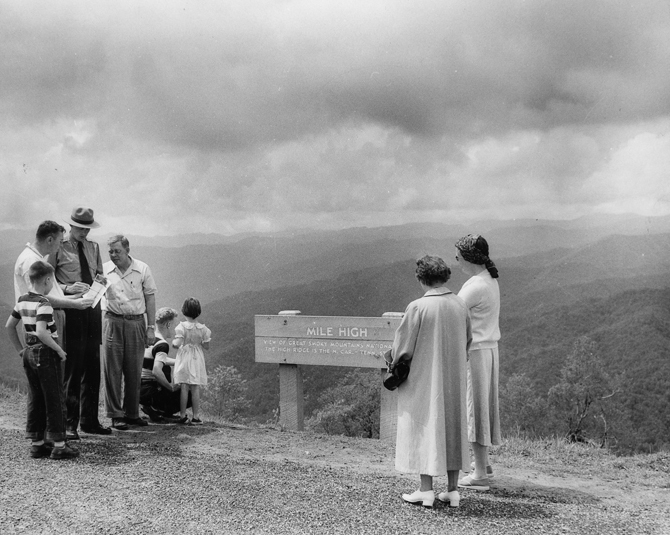 The curated parkway ultimately produced the popular legacy and iconicity of vernacular heritage, however, the parkway is in reality a representation of the NPS’s idealized version of rural Appalachian life. And herein lies the parkway’s problematic, while it aspires to present history and offer educational opportunity, the aesthetic and scenic experience is prioritized over the reality of pioneering mountain people. In effect, the history reveals the reverse relationship to what is perceived: the parkway became the reason and motivation for preservation, rather than the landscape as the reason for the road. While the parkway effectively helped preserve large areas of land and encouraged environmental stewardship, it was also part of the early movement promoting various arrested approaches to preservation. Its reliance on, and promotion of the scenic values of forested slopes made the road a poster-child for protective land management practices. The culture and practice of land management that was replaced by industrialization in the late 1800s had understood the need for adaptive management in a dynamic mountain ecology. The protective practices that inherited the landscape in the 1920s, however, mistook disturbance for a purely negative force, and introduced protective management strategies, which significantly impacted the composition of forest re-growth. Certain species, for example, the Rhododendron maximum, spread far beyond their original range without typical disturbances, such as fire. This flowering shrub now grows prolifically throughout the mountain slopes and along the parkway road verges, and has become a significant seasonal roadside attraction. The change in species composition has had a significant effect on canopy and the visual condition of the forests, but it has also affected conditions below the surface. The combination of changes in root density and plant structure has been attributed to decreased slope stability in some areas. The top-heavy structure of the Rhododendron has a tendency to initiate surface slumping in steep conditions, and has thus accelerated the entropic mountain processes. While this landscape effect cannot be directly attributed to the parkway, the road was part of an era and formalized certain cultural values in the landscape, perpetuating protective practices and ultimately shaping the new forest composition. By prioritizing the visual experience and the rhetoric of regional heritage, the focus of parkway management practices is towards the preservation of the original parkway experience. The vast area of landscape within the parkway’s viewshed is effectively reduced to supporting this elaborate pastoral perspective. In recent years, the road itself has stagnated. Visitation, though still high as compared to other national parks, has been in decline since 1990. In 2002 Concord Mills, a major shopping destination in Charlotte, NC, eclipsed the parkway as the region’s largest visitor attraction, indicative of shifting values for leisure activities. The smooth twists and turns of the roadway, so carefully designed in the 1930s to provide continuous travel and pleasant experience for viewing, no longer accommodate the driving speed and vehicle size of contemporary motor-tourists. Tunnel clearances and turning radii are not suited to today’s RVs and caravans, and additionally, campgrounds and picnic stations do not accommodate the infrastructure needed to support these large motor vehicles. Furthermore, all available gas service along the parkway was removed in later years due to outdated infrastructure and the environmental hazards of tanker truck delivery. Today, such services are only offered to visitors off the parkway, however availability is unsignposted at parkway exits. Concessions along the parkway have been reduced due to lagging economic viability, further challenging the convenience of a parkway visit. Visitor’s services and interpretive signage have been preserved in their original form to stay true to the value and aesthetics of the original parkway designers, rather than be enhanced or updated for contemporary modes of interpretation. No longer meeting the needs of the contemporary motor tourist, the parkway is now reduced to a simple one liner of cultural heritage. The landscape is frozen—the country’s largest museum in support of the legacy of nationalistic heritage tourism. This begs the question: how can we preserve the cultural legacy, and liberate the surrounding urban and rural landscape from the confines of a supporting backdrop to the pastoral perspective of cultural heritage? Beyond its nostalgia and glorification of the pioneering history, what is the contemporary value of such a legacy? What is the authenticity of such a constructed and curated legacy? By reconstructing the landscape history, the forces driving the shape of the modern Appalachian landscape and the parkway’s legacy become more evident. They help to articulate the frictions between the parkway and its landscape that produce the questions above. An authentic experience of this landscape, and fair interpretation of the legacy requires acknowledgment and legibility of the constructed nature of the narrative in the landscape. The parkway, as a museum of mountain life, objectifies America as a nation. If this relationship is reversed and the parkway itself becomes the object, understood as an artifact or monument rather than an accepted component of the landscape, the road may be detached from dependence on its surroundings. Do we monumentalize the roadway and liberate its surroundings from their supporting role; or do we sacrifice a degree of the preserved heritage of the parkway corridor, and bring the road up to date with contemporary needs? While the cultural, and even ecological value of the parkway is not to be underestimated, we must question the extent of control and influence this cultural legacy carries in the region, and the scale of landscape dedicated to its support. 1. Edward M. Bassett and Latham C Squire, “A New Type of Thoroughfare: The ‘Freeway’,” The American City, (November 1932), 66. John Connor, A Proposed Program for Scenic Roads and Parkways, (Washington, DC: US Department of Commerce, 1966). Stanley W. Abbott, “Parkways—Past, Present, and Future,” Parks and Recreation 31 (1948): 681. Norman T. Newton, Design on the Land: The Development of Landscape Architecture (United States of America: Belknap Press, 1976), 597. 2. For Olmsted, who was a key figure in convincing Vanderbilt of the value of devoting the Biltmore Estate to experimental forestry, the approach road on Vanderbilt’s property was the most important element in controlling a visitor’s understanding and appreciation of the property and landscape. Bill Alexander, The Biltmore Nursery: A Botanical Legacy (Charleston, SC: The History Press, 2007), 41 –48. Anne W. Spirn, “Constructing Nature: The Legacy of Frederick Law Olmsted,” in Uncommon Ground: Rethinking the Human Place in Nature, ed. W. Cronon, (New York: W.W. Norton & Co., 1995), 99–102. 3. Timothy Davis, “A Pleasant Illusion of Unspoiled Countryside: The American Parkway and the Problematics of an Institutionalized Vernacular,” in Perspectives in Vernacular Architecture, Vol. 9 (2003), 229 –232. 4. US DOT and NPS. Visual Character of the Blue Ridge Parkway, Virginia and North Carolina (Washington, DC: US DOT and NPS 1997), 7. 5. Davis, “A Pleasant Illusion of Unspoiled Countryside,” 233. 6. Abbott, “Parkways—Past, Present, and Future,” 684–685. 7. Ina W. Van Noppen and J.J. Van Noppen, Western North Carolina Since the Civil War (York, Pennsylvania: The Maple Press Company, 1973), 253–322. 8. Kathryn Newfont, Blue Ridge Commons: Environmental Activism and Forest History in Western North Carolina (Athens, GA: University of Georgia Press, 2012), 35–48. 9. Between 1900 and 1930, the region became the largest supplier of paper and pulp in the country. 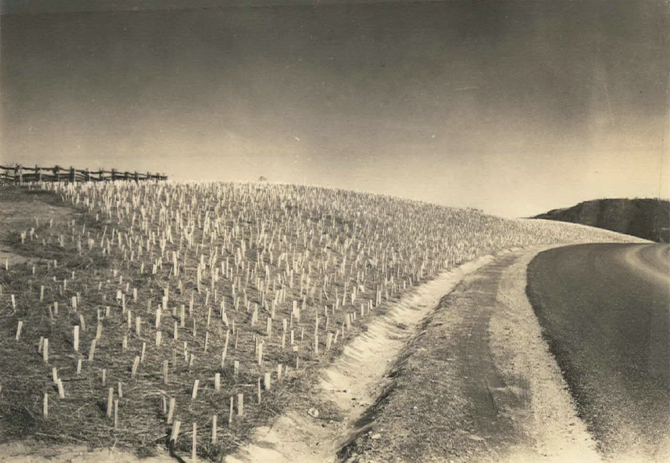 The landscape was purchased and divided by large industrial players such as the Ohio-based Champion Fibre Company, who employed thousands of people at their plant west of Asheville. 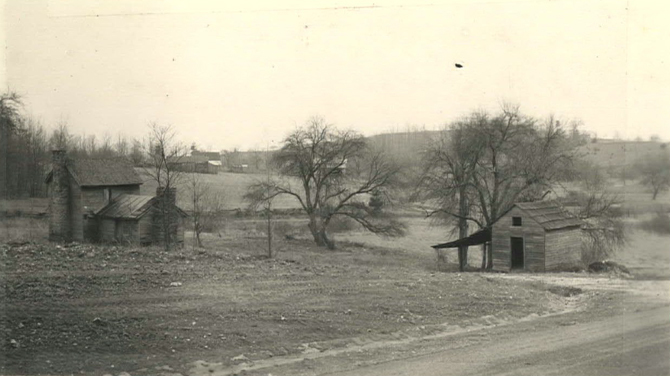 By the 1920s up to 60% of Western North Carolina’s had been clear-cut, and fires and floods that ensued destroyed much of the remaining landscape. In the midst of this destruction the regional conservation movement succeeded in beginning to establish managed national forests with the Pisgah National Forest, however, this forest management proved to do little to preserve the scenic qualities of the landscape upon which the tourism industry depended. A. Mitchell Whisnant, Super-scenic Motorway: A Blue Ridge Parkway History (University of North Carolina Press, 2006), 26–28. Sarah Gregg, Managing the Mountains (Ann Arbor, Michigan: Sheridan Books, Yale University Press, 2010), 14–17. 10. Ford’s Model T was first sold on the market in 1908. Over the next five years, as he perfected the assembly-line production, national production, and sales soared as the automobile became a popular consumer product, rather than a novel luxury. Marguerite S. Shaffer, See America First: Tourism and National Identity, 1880-1940 (Washington: Smithsonian Institution Press, 2001), 137. 11. In 1909, the Southern Appalachians Good Roads Association was established, promoting a network of long-distance roads through the mountains for the purpose of auto-touring. 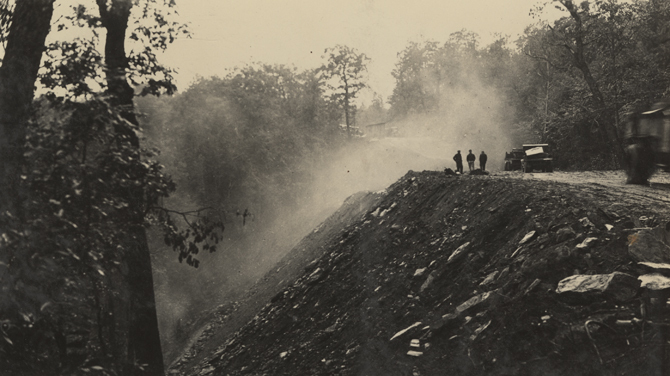 Joseph Hyde Pratt, president of the group and head of the North Carolina Geological Survey, proposed the idea for the Crest of the Blue Ridge Highway as an attraction to recreational motorists. This proposal was a direct pre-cursor to the Blue Ridge Parkway. 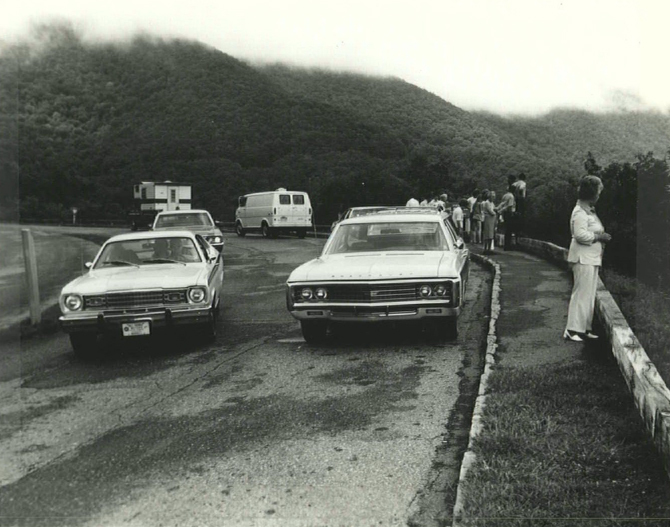 Whisnant, Super-scenic Motorway: A Blue Ridge Parkway History, 17–21. Van Noppen and Van Noppen, Western North Carolina Since the Civil War, 326–329. “A Motorist’s Creed,” in American Motorist 9 (June 1917): 27. 13. 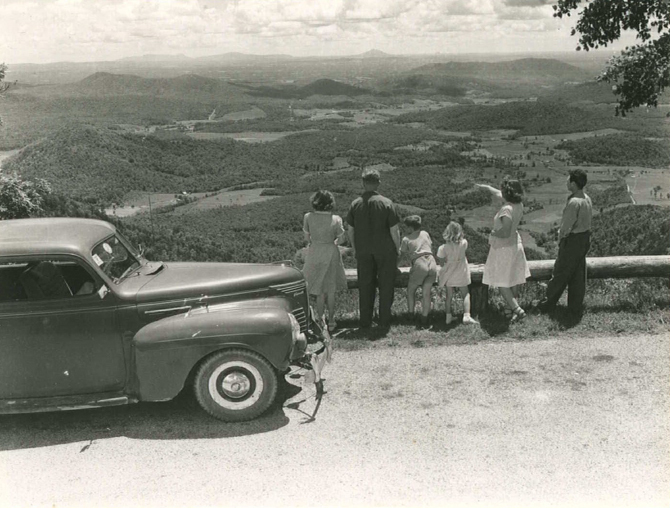 Whisnant, Super-scenic Motorway: A Blue Ridge Parkway History, 17-38. Harley E. Jolley, The Blue Ridge Parkway (Knoxville, TN: University of Tennessee Press, 1969), 15-20. Ethan Carr, Wilderness by Design: Landscape Architecture and the National Parks System (Lincoln, NE: University of Nebraska Press, 1998), 276. 14. Richard W. Sellars, Preserving Nature in the National Parks: A History (New Haven, CT: Yale University Press, 1997), 52–53. 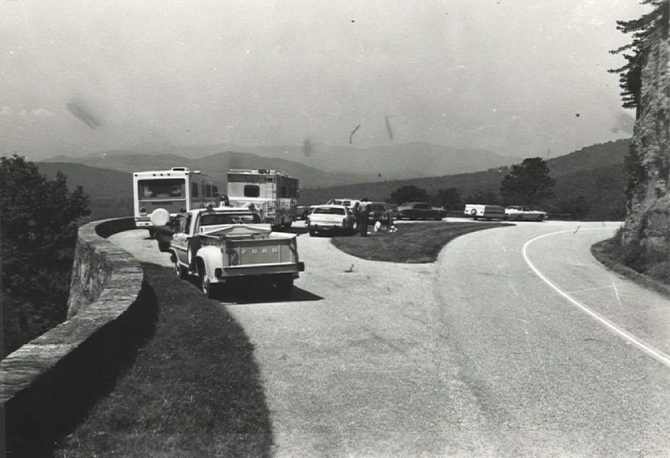 Whisnant, Super-scenic Motorway: A Blue Ridge Parkway History, 33–34, 38. Jolley, The Blue Ridge Parkway, 20. 15. Civilian Conservation Corps (CCC) was established in 1933 as a work relief program for young men. Unemployed men were selected from across the country and put in camps where they were trained in labor and heavy construction work, providing skills and employment, and improving the quality of public services and parks across the country. D. Meringolo, Museums, Monuments, and National Parks (Amherst, MA: University of Massachusetts Press, 2012), 112–114. Karen Hall and Friends of the Blue Ridge Parkway, Inc., Building the Blue Ridge Parkway (Chicago, IL: Arcadia Publishing, 2007), 11, 31. 36 New National Scenic Byways, All-American Roads, 2002, accessed January 18, 2015, http://www.fhwa.dot.gov/pressroom/fhwa0227.cfm. 17. The educational value of parks was fundamental to the National Park Service’s mandate. Mather, the first president of the NPS, believed strongly in the inherent edifying quality of nature, whereas Horace Albright, successor to Mather and NPS director at the time of the BRP, emphasized education as a programmatic imperative of the NPS. Meringolo, Museums, Monuments, and National Parks, 87–89. 18. Abbott, “Parkways—Past, Present, and Future,” 684–688. US DOT and NPS, Visual Character of the Blue Ridge Parkway, Virginia and North Carolina, 45. 19. H. Middleton, “The Good Road of the Blue Ridge,” Southern Living 20, no. 9, September 1985, 72–79. 20. 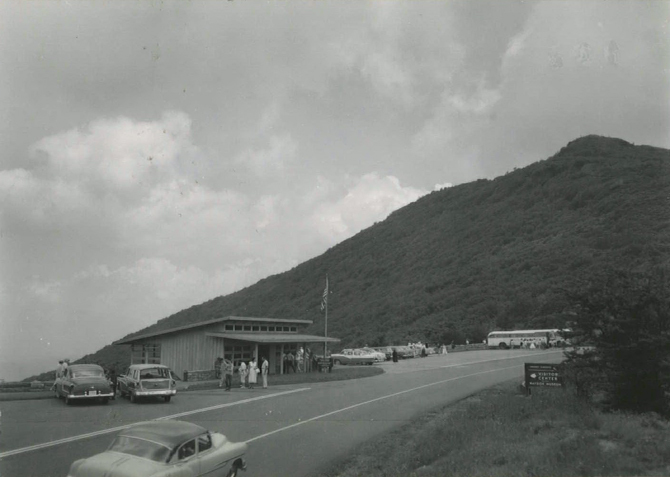 Whisnant, Super-scenic Motorway: A Blue Ridge Parkway History, 59–62. 21. Politicians and businessmen in North Carolina, Virginia, and Tennessee petitioned and lobbied for the road to be routed through their state, or next to their city, in hopes of economic benefits from the project. 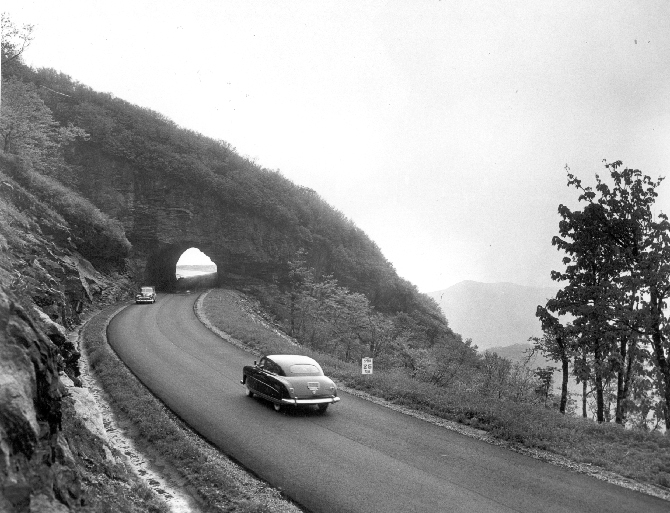 Whisnant, Super-scenic Motorway: A Blue Ridge Parkway History, 59–62. 22. US DOT and NPS, Visual Character of the Blue Ridge Parkway, Virginia and North Carolina, 46. 23. 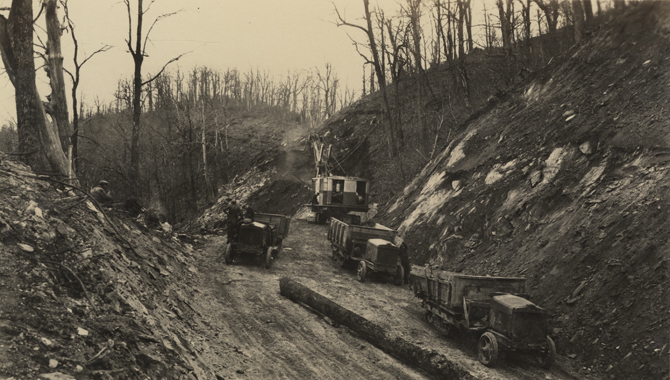 The unprecedented use of eminent domain for the purpose of conservation and recreational development was exercised first in assembling large areas of public land, including the Blue Ridge Parkway, in Appalachia in the early twentieth century. Gregg, Managing the Mountains, 2, 32–35. Anne Mitchell Whisnant, “About the Parkway,” accessed January 10, 2015, http://docsouth.unc.edu/blueridgeparkway/about/about_parkway/parkway/. 24. Abbott, “Parkways—Past, Present, and Future,” 686-687. 25. Early parkway planners restored and relocated a number of log cabins and pioneering buildings within the parkway corridor in an effort to preserve and best display their interpretation of early mountain life. The popular site of Mabry Mill was assembled as a countryside museum—more recent, modern constructions of the residents were razed, and rustic log cabins were relocated to the site to stage an idealized scene of rural Appalachian life. Similarly, the pioneering farm at Humpback Rocks, the Peaks of Otter site, and additional structures scattered through the length of the parkway were assembled and staged to produce a stereotypical vision of the Appalachian past, while buildings that did not meet this vision were torn down. US DOT and NPS, Visual Character of the Blue Ridge Parkway, Virginia and North Carolina, 175–201. 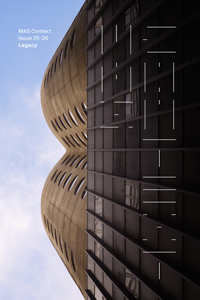 “Buildings,” National Park Service, accessed January 20, 2015, http://www.nps.gov/blri/historyculture/buildings.htm. 26. N. Robinson and I. Firth, “Abbott, Stanley William,” in Pioneers of American Landscape Design, ed. C. A. Birnbaum and R. Karson (New York, NY: McGraw Hill, 2000), 1-3. 27. For example: D. Hendershot, “More Blue Ridge Parkway Viewshed Protected,” Smoky Mountain News, December 2010, accessed January 25, 2015, http://www.smokymountainnews.com/news/item/2975-more-blue-ridge-parkway-viewshed-protected. H. Benton, “Jackson County landowners work with Land Trust for Little Tennessee to preserve parkway viewshed,” Mountain Xpress, January 2015, accessed January 25, 2015, https://mountainx.com/blogwire/jackson-county-landowners-work-with-land-trust-for-little-tennessee-to-preserve-parkway-viewshed/. 28. T.C. Hales, “Topographic and Ecological Controls on Root Reinforcement,” Journal of Geophysical Research 114 (2009): F03. 29. See “A Neighbor’s Guide of the Blue Ridge Parkway.” The document, published jointly by the National Park Service and Hill Studio—Community Planning, Landscape Architecture, Architecture, Preservation, in Roanoke Virginia, outlines steps to survey a site adjacent to, or near the Blue Ridge Parkway, and plan development for the least impact to the neighboring parkway. This includes suggestions for locating buildings, material colors and types, landscape strategies, and details down to the type of fence and gate to use on a property. 30. Concord Mills,” accessed January 25, 2015, http://www.visitnc.com/listing/concord-mills-1. “Concord Mills Mall,” accessed January 25, 2015, http://www.visitcabarrus.com/listing/?lid=1. 31. While limited parking is provided for RVs at most campgrounds and sites along the parkway, electrical, water, and sewage connections are not available. “FAQ,” Blue Ridge Parkway, accessed January 20, 2015, http://www.blueridgeparkway.org/v.php?pg=76. “Camping on the Blue Ridge Parkway,” National Parks Traveler, accessed January 20, 2015, http://www.nationalparkstraveler.com/parks/blue-ridge-parkway/camping-blue-ridge-parkway. 32. “Frequently Asked Questions,” National Park Service, accessed January 20, 2015, http://www.nps.gov/blri/faqs.htm. Aisling O’Carroll is a Senior Project Manager at Michael Van Valkenburgh Associates and a Design Critic in Landscape Architecture at Harvard University Graduate School of Design. Aisling has worked internationally with a range of architecture and landscape design practices and research platforms, and has a great interest in the stories that have shaped our urban spaces and landscapes.